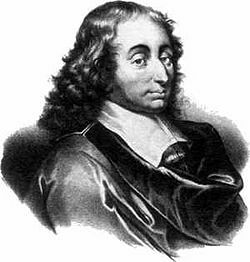 Blaise Pascal believed that direct arguments for the existence of God were futile, so he argued instead that religious practice was a good idea. In Christian theology, fideism is the position that reason is irrelevant to religious faith. Fideism can be both a response to anti-religious arguments, and a counterbalance to overly cerebral and philosophical arguments about religion. Several prominent figures have been fideists such as Blaise Pascal (1623 – 1662) and Søren Kierkegaard (1813 – 1855). Occasionally, the word "fideism" has been used to refer to the Protestant belief that Christians are saved by faith alone (sola fide), which is sometimes called solifidianism. Fideism emphasizes the importance of faith over reason in understanding God and living in accordance with God's word. Despite the fact that fideism is critical of reason, there are, ironically, several rational arguments made in favor of fideism. The fideist affirms that reason cannot achieve certain kinds of truth, which must instead be accepted only by faith. The philosopher Alvin Plantinga defines "fideism" as "the exclusive or basic reliance upon faith alone, accompanied by a consequent disparagement of reason and utilized especially in the pursuit of philosophical or religious truth" . Plantinga's definition might be revised to say that what the fideist objects to is not so much "reason" per se—it seems excessive to call Blaise Pascal anti-rational—but evidentialism: the notion that no belief should be held unless it is supported by evidence. Much Christian theology teaches that people are saved by faith in God (i.e. trust in the empirically unprovable). But, if God's existence can be proven, either empirically or logically, to that extent, faith becomes unnecessary or irrelevant. Therefore, if Christian theology is true, no immediate proof of God's existence is possible. Christian fideists often argue that human rational faculties are themselves untrustworthy, because the entire human nature has been corrupted by sin, and as such the conclusions reached by human reason are therefore untrustworthy: the truths affirmed by divine revelation must be believed even if they find no support in human reason. Religions founded on revelation call their faithful to believe in a transcendent deity even if believers cannot fully understand the object of their faith. I thank you, Father, Lord of heaven and earth, that you have hidden these things from the wise and understanding and revealed them to little children; yes, Father, for such was your gracious will (ESV). The statement "Credo quia absurdum" ("I believe because it is absurd"), often attributed to Tertullian, is sometimes cited as an example of fideism in the Church Fathers, but this appears to be a misquotation from Tertullian's De Carne Christi What he actually says in DCC 5 is "… the Son of God died; it is by all means to be believed, because it is absurd." This may be a statement of a fideist position, but it is also possible—and rendered somewhat plausible by the context—that Tertullian was simply engaging in ironic overstatement. Who then will blame Christians for not being able to give reasons for their beliefs, since they profess belief in a religion that they cannot explain? They declare, when they expound it to the world, that it is foolishness, stultitiam; and then you complain because they do not prove it! If they proved it, they would not keep their word; it is through their lack of proofs that they show they are not lacking in sense (Pensées, no. 201). Pascal moreover contests the various proposed proofs of the existence of God as irrelevant. Even if the proofs they proffer are valid, the beings they propose to demonstrate are not congruent with the deity worshipped by historical faiths: "The God of Abraham, Isaac, and Jacob—not the god of the philosophers!" Pascal's attitude has some commonality with another prominent Catholic writer of his period, Michel de Montaigne, who in his Essays shows a certain amount of sympathy with skepticism. Considered to be the father of modern irrationalism, Johann Georg Hamann (1730 – 1788) promoted a view that elevated faith alone as the only guide to human conduct. Using the work of David Hume (1711 – 1776) he argued that everything people do is ultimately based on faith. Without faith (for it can never be proved) in the existence of an external world, human affairs could not continue, therefore, he argued, all reasoning comes from this faith: it is fundamental to the human condition. Thus all attempts to base belief in God using reason are in vain. He virulently attacks systems like Spinozism that try to confine what he feels is the infinite majesty of God into a finite human creation. There is only one path to God, that of a childlike faith not reason. 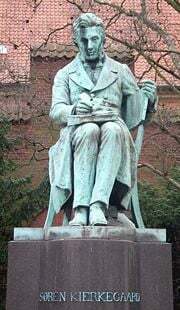 Fideism's position that God's existence cannot be certainly known, and that the decision to accept faith is neither founded on, nor needs, rational justification, may be found in the writings of Søren Kierkegaard (1813 – 1855) and his followers in Christian existentialism. Many of Kierkegaard's works, including Fear and Trembling, were published under pseudonyms; they may represent the work of fictional authors whose views correspond to hypothetical positions, not necessarily those held by Kierkegaard himself. In Fear and Trembling, Kierkegaard focused on Abraham's willingness to sacrifice Isaac. The New Testament apostles repeatedly argued that Abraham's act was an admirable display of faith. To the eyes of a non-believer, however, it must necessarily have appeared to be an unjustifiable attempted murder, perhaps the fruit of an insane delusion. Kierkegaard used this example to focus attention on the problem of faith in general. Presuppositional apologetics is a Christian system of apologetics associated with Calvinism; it attempts to distinguish itself from fideism, although some may find the difference elusive. It holds that all human thought must begin with the proposition that the revelation contained in the Bible is axiomatic, rather transcendentally necessary, or else one would not be able to make sense of any human experience. Presuppositional apologists believe that all people actually believe in God, whether they admit or deny it. According to the presuppositional apologist, the determination of the truth of religious statements cannot be directly determined by resort to the rules governing logical or scientific statements, only indirectly, by transcendental argument, where the truth of the statements are seen as the necessary condition of the truth of those very rules (and all other proof and reasoning). Immanuel Kant, P. F. Strawson, Moltke Gram, T. E. Wilkerson, Anthony C. Grayling, Michael Dummett, and Jaakko Hintikka, among others, have discussed transcendental forms of thought in recent philosophical literature. Presuppositional apologetics could be seen as being more closely allied with foundationalism than fideism, though critical of both. Although fideism is more commonly debated in Christianity, other revealed religions have debated it as well. In Islam, the theologian Al-Ghazali (1058 – 1111) strikes a position similar to Tertullian's fideism in his Talafut al-falasafa, the "Incoherence of the Philosophers." Where the claims of reason come into conflict with revelation, he argues that reason must yield to revelation. Ghazali's position of the absolute authority and finality of divine revelation became the standard of orthodox Muslim exegesis. However, his position drew a rejoinder from Averroes, who in turn had an impact on Thomist and other medieval Christian thinking. Some theologies, however, strongly reject fideism. The Catechism of the Catholic Church, representing Roman Catholicism's great regard for Thomism, the teachings of Thomas Aquinas (1224 – 1274), affirms that it is a doctrine of Roman Catholicism that God's existence can indeed be demonstrated by reason. Aquinas's rationalism has deep roots in Western Christianity—it goes back to Saint Augustine's observation that the role of reason was to explain faith more fully: fides quærens intellectum, "faith seeking understanding," is his formula. Pope John Paul II's encyclical Fides et Ratio (Faith and Reason) September 15, 1998 also affirms that God's existence is in fact demonstrable by reason, and that attempts to suggest otherwise are the results of sin. Therein, John Paul II warned against "a resurgence of fideism, which fails to recognize the importance of rational knowledge and philosophical discourse for the understanding of faith, indeed for the very possibility of belief in God." Historically, there have been a number of fideist strains within Roman Catholicism. Catholic traditionalism, exemplified in the nineteenth century by Joseph de Maistre, emphasized faith in tradition as the means of divine revelation. He argued that the claims of reason are contentious because various people have argued rationally for several contradictory things. Therefore, the safest course is to hold true to the faith that has been preserved through tradition, and to resolve to accept what the church has historically taught. In his essay Du pape ("On the Pope"), de Maistre argued that it was historically inevitable that all of the Protestant churches would eventually seek reunification and refuge in the Roman Catholic Church because science was the greater threat that threatened all religious faith. The fideist impulse to place faith over reason is understandable in light of the rise of Deism, as well as modern scientific challenges to faith posed since the Enlightenment. But one-sided, mutually exclusive perspectives obstruct the development of a healthy and balanced religious experience in human life. The faculty of reason is also a gift of God, to be used for human betterment. Nevertheless, elevating faith in God above human reason is often a necessary step in restoring a relationship to God for humans whose condition has been corrupted by sin, for sin can afflict even the subtle postulates and direction of human reason itself. Many believers encounter an irrational demand at some point in their walk of faith, like God's request to Abraham that he sacrifice Isaac. Making that "leap of faith" leads to new insight, a rebirth, and the ability to see reality and reason about it on a higher plane. Nevertheless, over time a complete relationship with God should require the active use of all one's mental capacities—including rationality—to understand and engage with God's plans for our life. ↑ On the Flesh of Christ, Translated by Dr. Holmes. New Advent. Retrieved August 28, 2008. ↑ John Paul II Faith and Reason. . Vatican Library. Retrieved August 28, 2008. Marmura, Michael E., trans. 2002. Al-Ghazali's The Incoherence of the Philosophers, 2nd ed. Brigham Young University Press. An English translation of tahfut al-falasifa that includes the Arabic text. ISBN 0-8425-2466-5. Fideism entry in the Stanford Encyclopedia of Philosophy. Tertullian's De Carne Christi On the Flesh of Christ. This page was last modified on 7 April 2017, at 19:48.